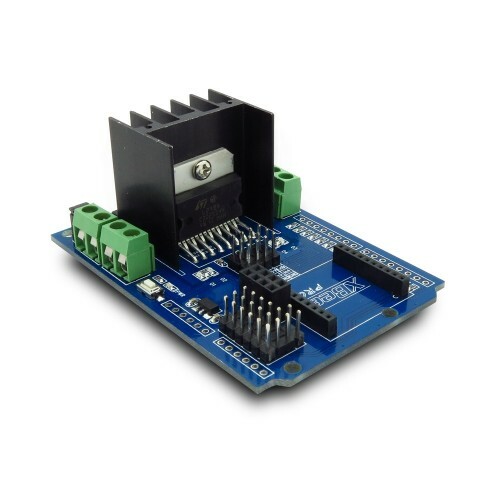 It is a Arduino Compatible shield, You can use this shield to drive two/four DC motors (upto max 4A) or an four-wire two-phase stepper motor. For power supply, power terminal on board is available – it will also power the Arduino board. Or from the power jack on Arduino board, the shield will get the power form the Vin pin of Arduino and drive the motor using this power. In many motor and robot project, you need to use the wireless communication, so on board we build a wireless area. Now you can directly put a XBee (or other XBee pins compatible module, like BTBee) and a nRF24l01 module on the board. This design can be used as the motherboard of many motor or robot project, because it has enough resources for wireless communication, sensor data acquisition and some simple control. This Board not only can be used as a Arduino shield, but also can be used as a DC motor driver platform, so we didn't assemble the general header pins or Arduino Stackable pins on board (packed with the board), so that it will have more applicability - using the positioning hold on board, you can fix it on your robot chasis.